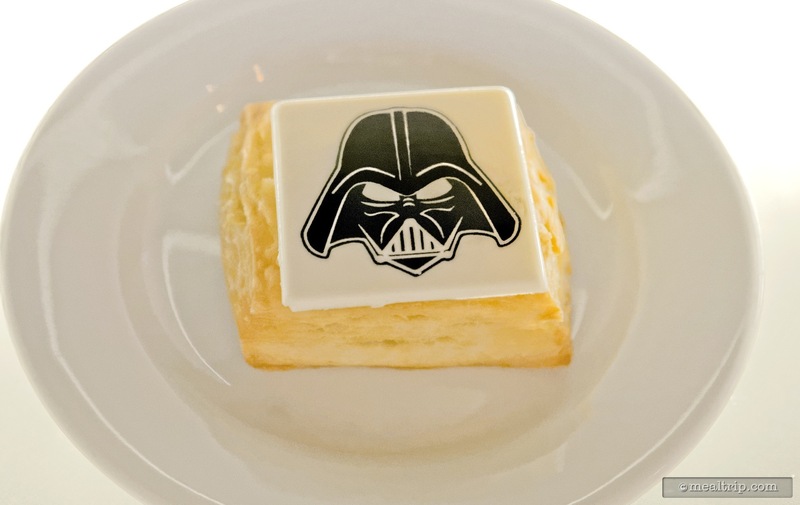 The Star Wars Dine-In Galactic Breakfast is a special event that only takes place from May 4th, until the end of the "Star Wars Weekends" events at Disney's Hollywood Studios. 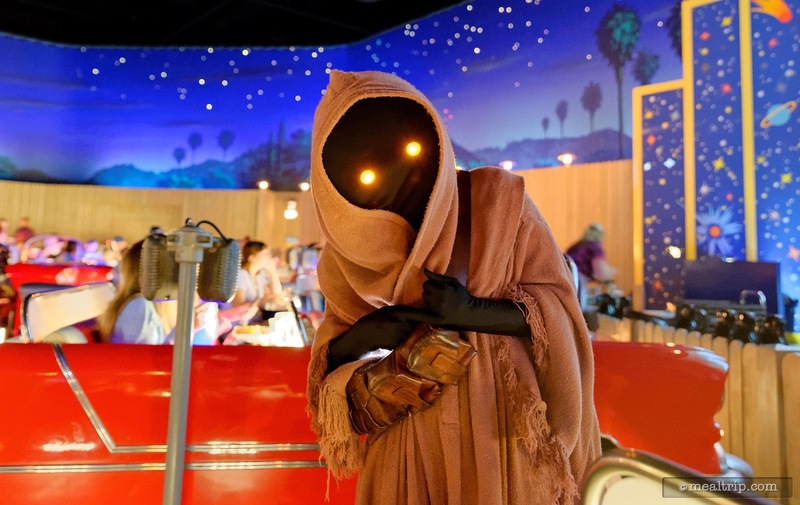 Once inside, Greedo, Jawas and a couple of Stormtroopers mix and mingle with guests while you enjoy breakfast, sitting in booth-tables that look like cars from the 60's, while watching clips and various outtakes from the Star Wars franchise. Quite a bit of food is available as the meal price includes your choice of beverage, a small fruit or yogurt appetizer, a pastry tray, and a breakfast entree item that you can select from the menu. 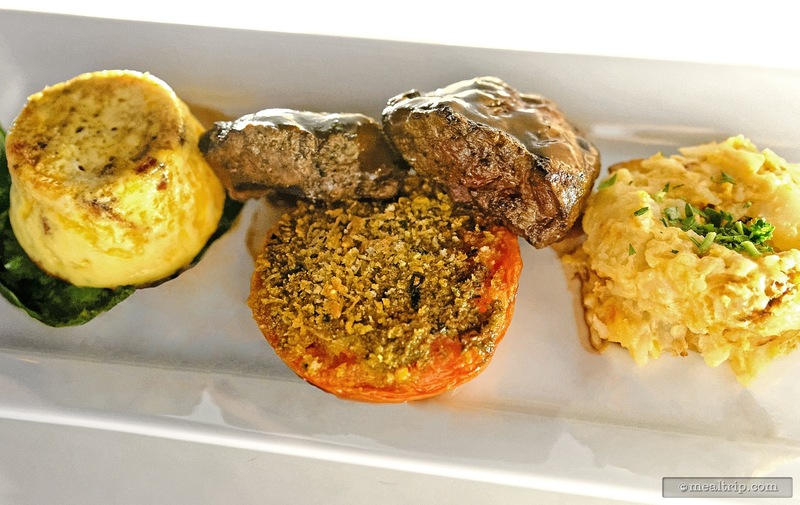 While not necessarily noted in the official "fine print", (this is a table-service affair and not a buffet) servers often ask if you would like more food at the end of the meal. Many have had luck getting seconds... if you have room. Advanced booking for this experience is highly recommended. Slots fill up fast, especially during the Friday through Sunday weekend period. 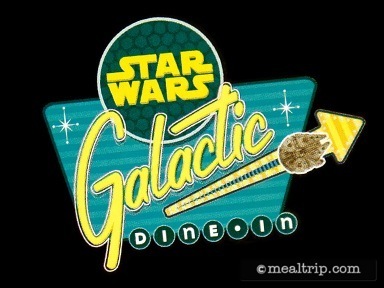 The Star Wars Dine-In Galactic Breakfast is a special event dining period that usually takes place from May 4th until the end of the Star Wars Weekends at Hollywood Studios. While this is a character meal, it is not a buffet style breakfast. This is one of those odd dining events where I'm on the fence about all of our rating categories here at Mealtrip, not being able to say I left feeling extremely positive or negative about the experience. 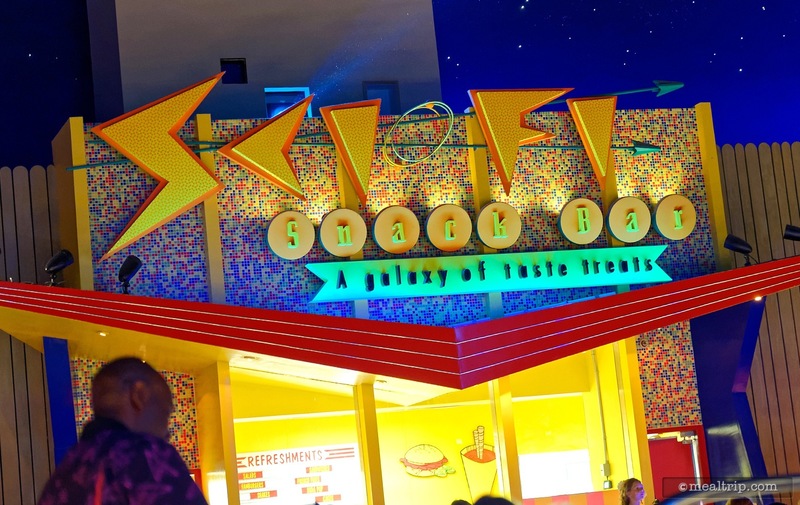 The Sci-Fi Dine-In Theater Restaurant is located toward the back of the park, at the corner of what's known as Commissary Lane and New York Street (very close to the Writer's Stop). The location is not normally open for breakfast, so that in and of itself is unique. Once you have checked in at the outdoor greeter's kiosk, there seems to be a 10 to 20 minute wait before your party's name is called. There is no "pager" system at Sci-Fi, so you'll just have to "hang around" in the middle of a busy walkway to hear your name being called by cast members. Once your name has been called, your party gets to wait in another outside line. This isn't really unusual for any character enhanced meals where you get an opportunity to take photos with the characters before moving into the dining area. It does however, highlight the fact that this dining location doesn't usually offer character meals. The two-step "hang-out in the crowd then wait some more in a line" process seems particularly out of place here. I can imagine on a warmer day, standing around outside in dappled sunlight for what could be as much as a half hour, would be slightly uncomfortable. The big wait is a result of the most valuable character photo-op of the whole experience. 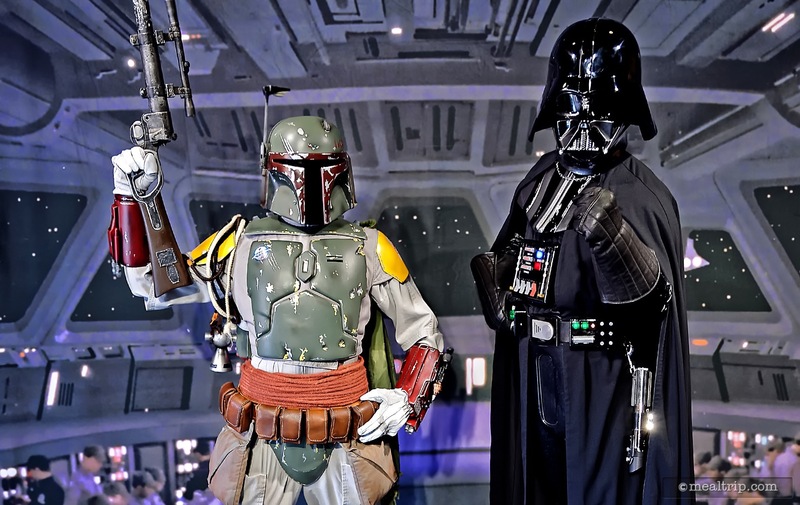 Once you move from the outside line directly to the inside... you will find yourself in the middle of a brief meet and greet with Darth Vader and Boba Fett. Brief however, is a bit of an understatement. You are told, before going in, that Darth and Boba won't be signing autographs and are taking quick photos only. A PhotoPass photographer is on-hand and will take a few snapshots with their cameras. These few photos are available as FREE downloads via the PhotoPass system, so be sure to take advantage of that. You are also welcome to take a few of your own photos of your group with the menacing duo, but once the PhotoPass photographer takes their shots, there seems to be a palpable tension in the air to get everyone out of the room as quickly as possible. I realize that this photo-op is the cause of the "big wait" outside, but there should be a better system in place than to make guests feel like unwelcome party crashers. Upon being seated in the main dining area which is set up like a drive-in theater, complete with car-booths, you're given a souvenir lightsaber! The small LED wand glows a steady red or blue, depending on which "side" you're on, the Empire or the Alliance. The cool giveaway also acts as a flashlight, so you can read the menu! 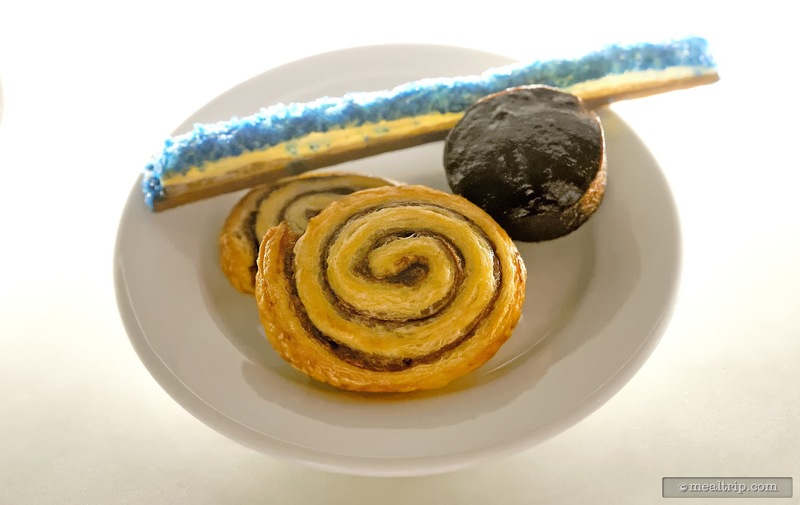 Along with your standard beverage selection (with the addition of "Bantha Milk" or Blue Milk) the food portion of the event begins with a pastry plate that contains A Blue and Red Lightsaber Puff Pastry Stick, Cinnamon Rolls, Double Chocolate Muffins, and two Darth Vader Vanilla Cream Turnovers. Each booth row gets one plate to share, but there was an indication that if you wanted more of those, there wouldn't be a problem in getting another plate. The pastries themselves, were all quite good... possibility the best food during the entire meal actually. 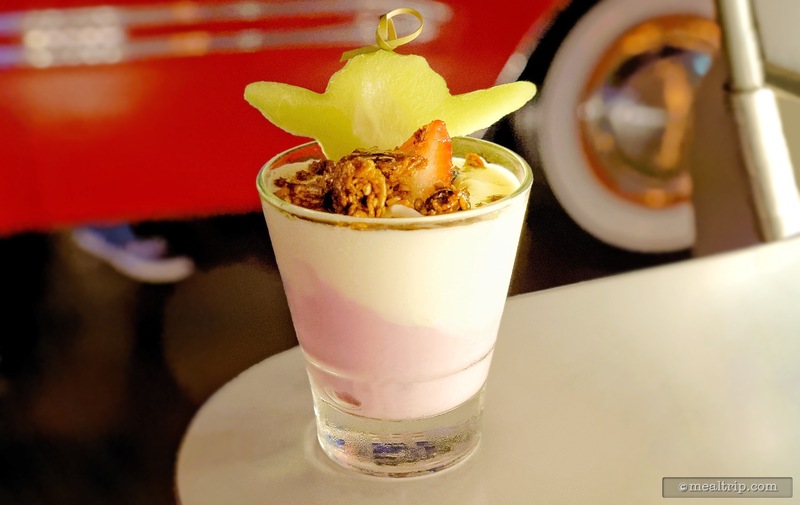 Next up, a choice between cut fruit in a cup or a Greek Yogurt Parfait with Homemade Granola, both come with a cut fruit Yoda head topper! The "appetizers" were also very good, but frankly do not require much in the way of skilled preparation, so they are about what I was expecting quality-wise. Interestingly though, after a plate of pastries and yogurt, normally "light breakfast eaters" might already start to feel a bit full. 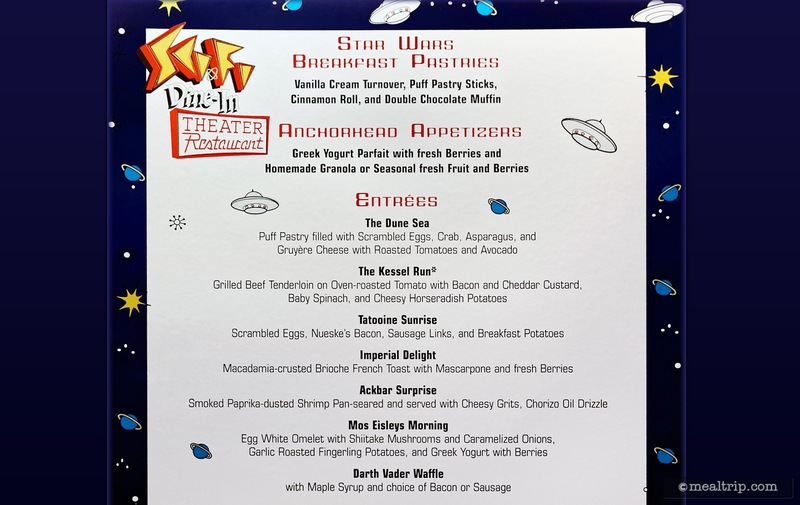 The Entree portion of the breakfast menu contains quite a few interesting sounding dishes and a few breakfast standards (like eggs and bacon plates, etc. 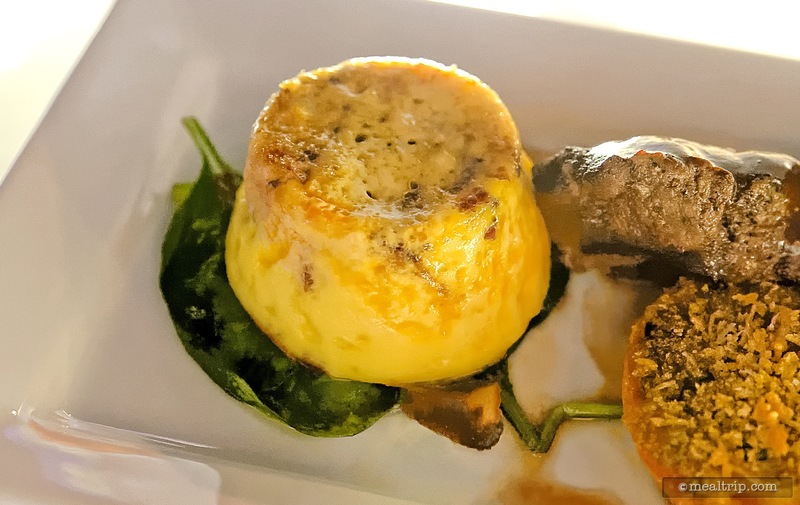 ), and includes a Shrimp and Grits entree that received praise from my in-car table companions, as did the "Dune Sea", a puff pastry filled with crab, scrambled eggs, asparagus and gruyere cheese. I opted for the "Kessel Run", a plate that combined two small steaks, roasted tomato, cheesy horseradish potatoes, and a bacon and cheddar custard (which is more like a tiny crustless quiche). My entree was good. Not great, not bad, but just good. For me, it didn't really live up to the promising description that was on the menu. If there's only going to be two 2oz cuts of meal on a plate, they better be great cuts of meat... and they weren't. Good flavor, but overcooked, and cut with a knife... plus a lot of elbow grease. The custard had a nice smokey flavor and a sharp note from the cheddar cheese, but not the best quiche filler I've ever had. The cheesy horseradish potatoes were light on flavor, and what flavor there was in the dish... didn't seem to be horseradish or cheese. They were potatoes, and nothing more. 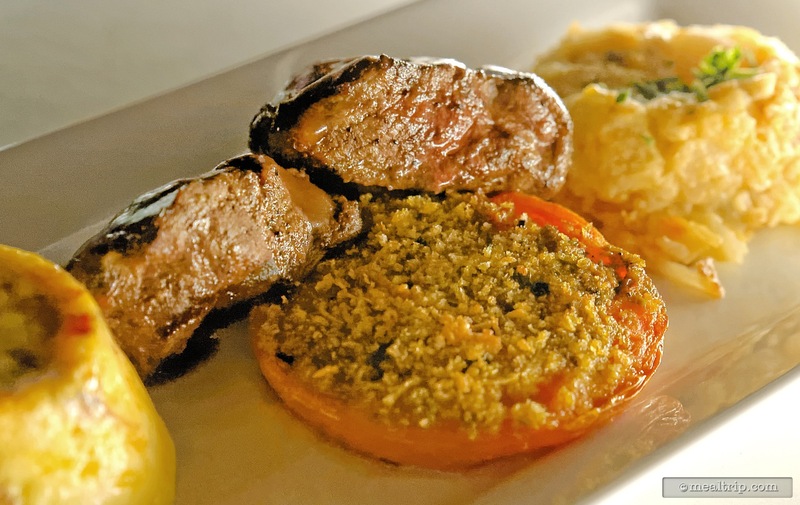 One of the more flavorful things on the plate was the over-roasted tomato. Topped with herbed panko bread crumbs, there were textural and flavor combinations from this one "garnish" that I wish the whole dish would have exhibited more of. While eating breakfast, and watching clips from various Star Wars movies on the big screen, several Star Wars characters stopped by. Greedo and several Stormtroopers were on hand, and spent the most time with guest. The only problem with having a character meal in a drive-in is... that it's dark... really dark. Photos are a bit challenging, to say the least. Most guests will almost certainly have to use flash, or an on-camera/phone light of some type just see what they are taking a picture of. Interacting with the characters without taking photos is probably the most fun when the Jawas come by. They are looking for stuff to trade! Yes, an actual activity. They don't like silverware or money or worthless things like gum wrappers, but if you have anything from a pen to a hair-clip (and possibly a paperclip)... they may just be interested in trading with you for something in their droid bag. Which I have to admit, is fun because they play the parts very well. All in all, I'm glad I went. The food was good, but not great. The characters and interactions were great, but it's really hard to take any photos with the characters. 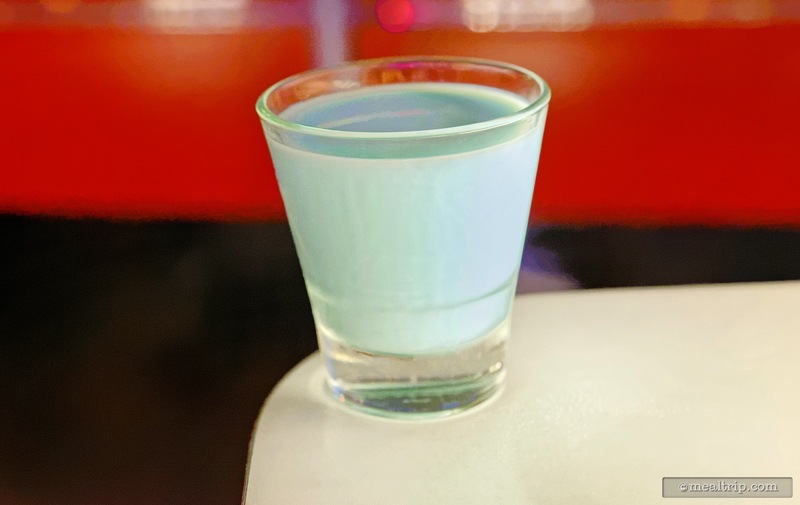 The take-away lightsaber is very cool though. The price point seems a bit high for the experience, even by theme park standards. 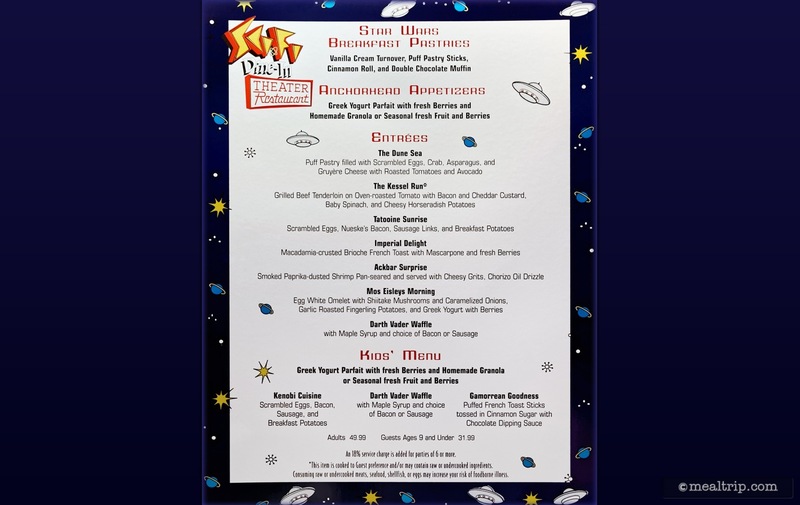 At two dining credits per person, (or $49 per person, plus tax, plus tip... and with no discounts for pass-holders or Tables in Wonderland holders), it's more expensive than similar character dining experiences, such as the Magic Kingdom's Crystal Palace or Animal Kingdom's Tusker House... and, it's not a buffet. 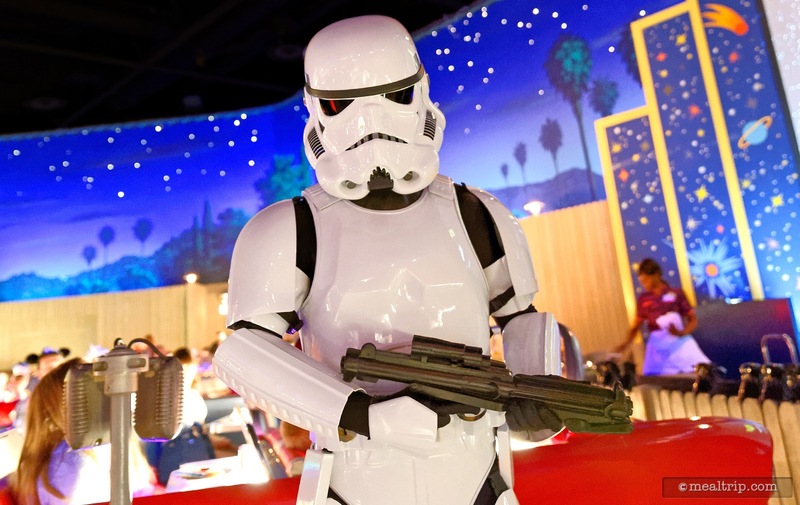 At the end of the day, it's the Star Wars theme and characters that will be the draw here (not the food so much), but in an environment that's so dimly lit, the only proof that you went to the event may just be the photos with Darth and Boba before breakfast began. If you are really into Star Wars, it's something to consider. Now that I've done it once, I'm not sure I would return. 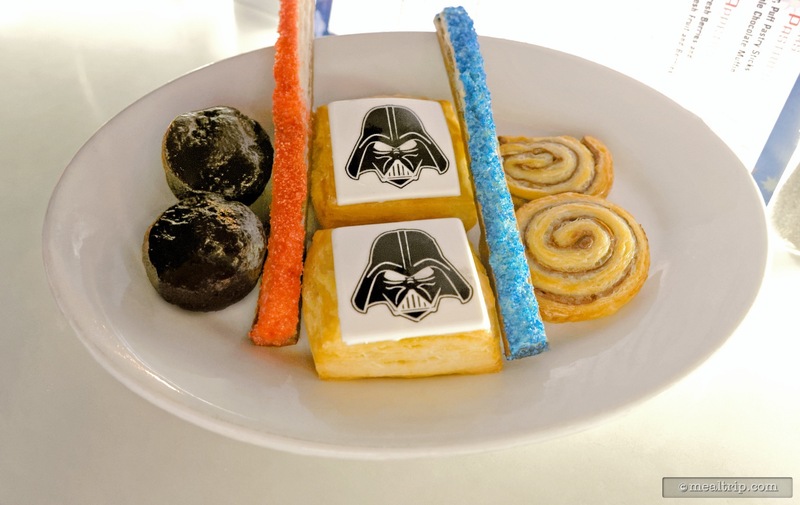 Many of the other "Star Wars plus food" related offerings during Star Wars Weekends have that "I want to do this again next year" quality about them.